I took the liberty of running the Flex Mode version of Immerseus over the weekend. Did manage to kill it within a few attempts. Our gear was scaled to 506 item level. Our group consisted of 10 players so we didn’t get a chance to check out the dynamic scaling in action. Players that are deep in the normal mode of Throne of Thunder shouldn’t have much difficulty with this boss. Check out the video and make note of the healing tips. On Monday, we had multiple attempts where we were able to push him down to 2%. But we couldn’t put him away. We simply suffered too much damage and he casted us aside like dolls. The team has gotten better collectively when it comes to the intermission phases. We’re ending the second main phase on an Overcharge and this is where it gets a little tricky for us. Lei Shen will hit the second intermission at 30%. I tend to call for players to split and head to their assigned corners at around 33%. Around this time, we’re going to get either an Overcharge (the donut) or the AoE balls. If I prepare for the Overcharge but call for the stack, we phase him too early and everyone won’t be in position on the other corners resulting in deaths. If I hold DPS to eat the Overcharge and then dispatch players to the corners, we run the risk of either Overcharge catching players and stunning them or we don’t have enough punch to force him to phase before the lightning balls come out. If lightning balls do come out while we’re spread out, we’d have to contend with them during the second intermission. Last night, I blew two calls directly leading to wipes at that time. On one of those wipes, we were short two DPS (we would’ve been on track had them been alive). I’m debating handing the steering wheel to someone else instead because it’s taking me long to get it right. Wouldn’t be so bad if it’s a 10 man. It’s only 10 people that get pissed at you. The pressure is amplified in a 25 man though. I sure as hell don’t feel the most confident waltzing into the final phase. We’re going to try to have range loosely surrounding Lei Shen (not max range) and AoEing lightning balls as they come. I feel overloaded. We need to crush this guy! Ever play Ultimate (or Ultimate Frisbee)? The rules are quite simple. You have two teams starting at opposite end zones who attempt to advance the disc to the other team’s end zone. Once the pull (like a kickoff in football) is initiated the teams can start jockeying for possession. A team that advances the disc to an end zone secures the point. Kicker: The person with the disc can’t move. They can pivot on one foot but they can’t move. The opposing team gains possession whenever any pass is incomplete, intercepted, or received out of bounds . Teams will employ different strategies to prevent the other team from scoring. One of the common defensive strategies is zone defense. Players are pre-assigned to sections of the field as they attempt to intercept and stop opposing players from advancing towards their end zone. It’s used to stop the offensive team from making really long passes. There’s usually one or two players that will close in on the disc handler. There’s different variations of it, but the key concept is that the defenders have their own sections to work with (not to mention that covering a small area instead of advancing up and down the field all the time is great at minimizing fatigue — I would know). Gosh, I can’t wait for summer to get here. Now the concept of zone healing works the same way and is used in situations where not every player is within range of the healer or where players are constantly shifting in and out of range. Sometimes there are raid mechanism place preventing you from moving or that keep you constantly away from each other. Zone healing is an approach that directs the healers to only heal the people that are within range of them. They must trust the other healers to cover the players near themselves in other areas. If you’re assigned to the blue beam of Durumu’s platform, then you can heal anyone that comes in range as the other beams are being moved around. Most raid frames have a function where the individual frames turn transparent if a player isn’t in range. As the healer, this makes your job easier. Any frames that are opaque (or solid) are the players that depend on you to live. I understand, I have trust issues too. For the officers, zone healing is a great way to isolate which healers are true rock stars and which ones are struggling. Ji-Kun has an ability called Caw. It’s a common raid mechanic where she’ll send sound waves at a player and damages anyone nearby within 8 yards. This calls for people to be spaced out around her main platform. Depending on which Ji-Kun strategy you use, you’ll have groups clearing out nests and may not have the same, consistent number of players on the main platform at all times. Be flexible. Healers will have to generate threat on the little anima golems at the start of the fight to hold them in place. If the golems are brought together, their attack speed greatly increases and will quickly snowball into a wipe. This requires everyone to stand in place. As the little golems are gradually killed near the Massive Anima, players will be freed up and can move around the room consistently. In addition, Matter Swap will switch players with their most distant ally forcing healers to react accordingly and dispel or heal any teleported players. As a healer, you’re not going to be able to hit everybody. DPS and tanks will come and go through your area of the map. It won’t always be a set group of players all the time. Keep the players in your zone healthy! After two and a half weeks, we finally scored a kill against Garalon. Every encounter after the first six progression hard modes is an exercise in patience and grinding. Our first (and only) Spirit Kings kill was a huge sigh of relief. By comparison, the Garalon kill was falling out of the chair from exhaustion. During the pulls pulls where everyone gets a good look at the new mechanics, people play a little more cautious. Everyone’s testing the boundaries of what they’re capable of. They’re experimenting with their specs and retuning themselves specifically for that fight. But once people start getting the hang of it, it gradually gets easier. Once the strategy is ironed out and the team is exposed to the rest of the phases, it’s a mammoth of a DPS and healing check. Our kill on heroic Garalon mirrored our kill on normal. I swear Garalon was mid-air just before the enraged Crush was about to connect. Healers were busy throwing as much DPS as they could in the final seconds. All the pulls earlier on in the night were all over the place. It’s easy to tell when players are losing focus. They trip into the crush-zone. They’re sloppy on Pheromone passes. They get caught by the cleave. Chalk it up to nerves. Maybe they’re gripping the mouse too hard. Who knows? Everyone deals with anxiety and pressure differently. Garalon’s pretty damn nerve wracking as it is. All the strategies that are used on normal still apply. Keep the DoT classes working on the legs while the ranged players focus down the torso. Melee players will be jumping from leg to leg. We like to open the fight with Heroism but it’s not uncommon for it to be used in the final sub 33% phase. We opened our Pheromone kite order with 2 tanks, then all the ranged DPS, then all the healers. You might want to pick a melee player two as the final backups in case your kiters suffer casualties along the chain. Players that are next on the kite order should be in position when the current kiter has anywhere from 6 – 9 stacks as you’ll be passing around 13. Given the option, it’s okay to get rid of the Pheromone before a crush even if your stack isn’t near 13. I had to hand mind off at around 10. Had I waited to pass it after the crush, my stacks would have reached 15. The kiters near the stairs should leave a few gaps in Pheremone puddles as they drop them. This gives more path options for the kiters further on down the assignment chain. Crush is no longer coupled to Pheromone passing. Have a raid-wide defensive cooldown planned for each Crush. Healers should spike low health individuals in the few seconds leading up to a Crush so that they don’t take lethal. Spirit Shell gives you an edge. With two, it’s possible to alternate that on Crushes. Atonement DPS on legs (especially within the blue circles) is a major plus. Echo of Light is also amazing. As a Shadow Priest, I feel like I’m the worst DPS class on this fight. Maybe it’s just me. Nothing like seeing myself in 16th place consistently. The next boss for us is heroic Lei Shi. Right now, our biggest hurdle is consistently handling the Protectors as they spawn at the 20% intervals. They seem to ace and crush our healers quickly. How did your group handle them? Ever wanted to come up with your own raid strategy instead of relying on videos and write-ups from people in the community? 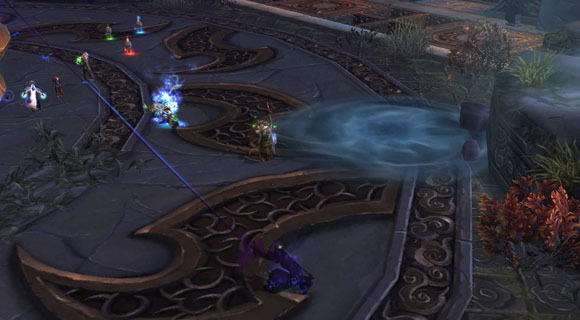 One of the recent raid tests on the 5.2 PTR was for Jin’Rokh. He’s the very first boss of the instance. 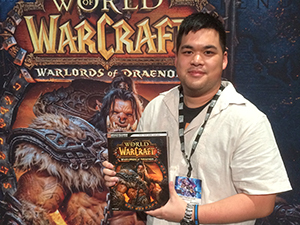 He serves as the DPS and mechanics check for the Throne of Thunder. In today’s post, I am going to show you Jin’Rokhs abilities. I won’t tell you how to beat it. You’re going to put on your raid leading tactics hat. I want you to tell me how your team is going to beat it. There are four statues in the corner around the room. Jin’Rok will throw a tank against the statue (Thundering Throw). The tank takes 250k+ in damage. Nearby players within 14 yards will take 200k and become stunned temporarily. The impact of Thundering Throw creates a pool of water on the ground. All players standing in this gradually growing circular-shaped pool gains Fluidity (40% increased healing, 30% increased damage done, but 80% nature damage taken). The pool increases the damage of any nature damage dealt by the boss to anyone standing within it. Every so often, Jinrokh spawns an orb close to him (Focused Lightning). The orb will target a player and slowly travel toward them (Note the eyes above the player). When the orb reaches a player, it detonates and creates a mini-lightning spike (called a Lightning Fissure). If a player kites an orb into an existing Lightning Fissure, it will explode for lethal, raid-wide damage on contact. If an orb contacts a player inside the water, all players will be hit for 150k+. 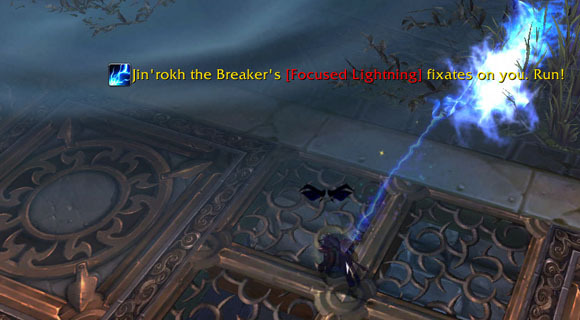 After the pool expands to a quarter of the chamber, Jinrokh summons a lightning storm inflicting 70k damage per second to all players for 15 seconds. In addition, this storm electrifies the existing pools rendering players unable to use them for appropriate buffs and taking massive damage. 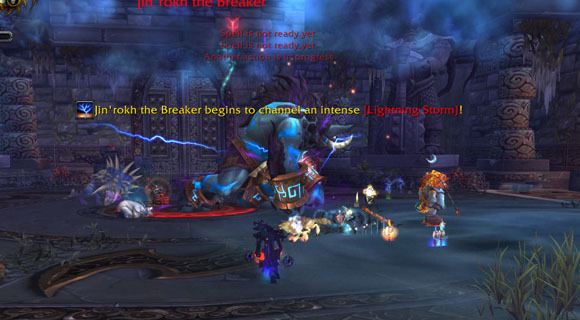 How is your raid going to defeat Jin’rokh? Where should they stand? Where does the boss get positioned? Can’t drive in real life? Maybe you’ll do a better job against Lord Rhyolith. Imagine if you were driving a bumper car. The catch is that there is no steering wheel. Instead, you have to lean in a certain direction in order to get the car turning. Not only that, the accelerator is locked in place. You can’t stop, you can’t slow down and every few seconds it randomly decides to just give out before restarting again. Oh, and if you make it to the side of a room, you explode. That’s essentially Rhyolith. I haven’t even mentioned the numerous fire effects yet. Your job as healers is to buy your raid group enough time for them to steer him into volcanoes and get rid of debuffs. Off tank: Infernal Rage are giant fire elementals that need to be snapped and dragged away from the group to the edge as fast as possible. They AoE any players within 12 yards. Their damage gradually increases every 5 seconds but the good news is that the amount of damage they take also increases every 5 seconds. Don’t let that fool you. Kill them fast. Pick 1 player to call out the foot that needs to be DPS’d. Our caller experienced success when he was positioned to the side of Rhyolith instead of behind him. Rhyolith’s body has a habit of obstructing the view. Going from the side should at least give you a rough 270° degree field of vision which includes the direction Rhyolith is facing. With his 80 stacks of Obsidian Armor, the firepower in your raid group is going to get blunted until they whittle that armor down by steering the rock dude over exploding volcanoes. The only way to steer it is for your players to DPS the foot that you want him to turn. For positions, instruct the the raid to stay near the middle of the island (and your drivers are exempt). Tip: Enable name plates as it clearly labels the legs. For starters, pick a leg to get started with. We like to open up on his right leg first just to get him gradually spinning around. Concussive stomp: He lifts his foot up and then stomps the ground. Contrary to popular belief, it appears that jumping at the precise time of the stomp does not negate the damage. There is a slight chance you may resist it. Volcano: When Rhyolith ignites a volcano, every player is going to 36000 damage or so over 6 seconds to 6 players on 25 (3 players on 10). When a player is hit, they gain a debuff (Eruption) causing them to take an additional 10% Fire damage every 14 seconds. If your own stack goes above 8, use a self cooldown. Heck, use a raid cooldown until they wear off. Crater: This is the most dangerous ability. It will catch players unaware. There is a chance that a crater will cause a stream of lava to stream outward. Any player caught in the path takes 70000+ damage. One or two players eating that is no problem. Raid healers can take care of that easily. When you have a dozen players getting ripped by that with the fire debuff, it becomes a problem. Tip: Designate a specific player or 3 to specifically call out streams when the ability kicks in. With the amount of stuff on the ground, it’s easy to miss. Once Lord Rhyoliths’ stacks drop to 10 or less, your group doesn’t need to worry about steering as much. Enough armor has been shaved off to the point where you can bring him down to 25%. That triggers the second part of the encounter. The last phase is extremely straightforward. Once you get to that point, you essentially have the encounter in the bag. He can now be tanked. Regroup your tank healers on your main tank. Pay attention to your individual stacks of Eruption. I found that if exceeded 8 stacks, the damage would be almost unbearable and a wipe would be imminent. Raid cooldowns are needed until the stacks drop off. The biggest threat are the fire veins that seem to sprout from volcanos. Between that and the decreased fire resist, players will die if they’re not watching where they’re standing. You might be able to eat the initial burst. I’ve had to do it once or twice to close the distance to a tank. I certainly don’t recommend doing it unless you know what you’re doing, have little to no stacks and have a self heal (or a healthstone) to negate the damage. Desperate Prayer really helps here. Watch the ground for any fire veins before using your hymns. Lay down Healing Rain somewhere around the middle of the map. Your players can spot the blue circles and stand on top of them easily. Not uncommon to see Rebirths being used on the encounter. Get away from any craters or volcanos before using them. Watch the ground for any fire veins before using Tranquility. With so much rampant fire damage going around, there is no wrong time to use Aura Mastery throughout the first phase.